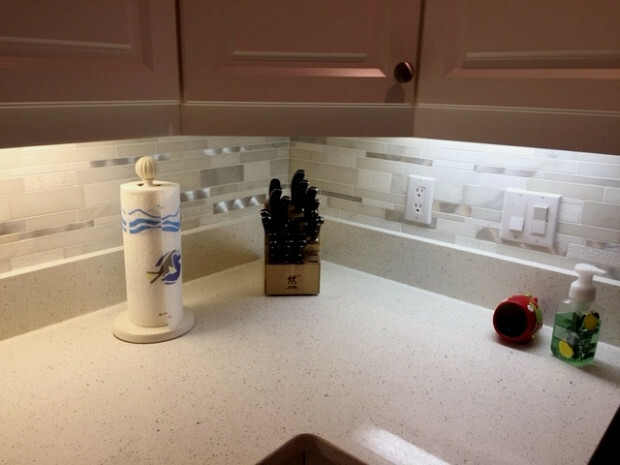 WHAT OUR NETWORX CONTRACTOR DID FOR US: Tile backsplash installation in new kitchen remodel. WHY WE CHOSE HIM: Quick response. We just redid our whole kitchen a few weeks ago; I’d put in the cabinets, the countertop, and a sink so big it looked like the cows should be drinking from it. There was still one last finishing touch that needed doing, though: the backsplash. I’ve never done this before; I just typed in online “backsplash installers” near our hometown and three people called me back. I went with the first, Boston Tile & Marble Inc., because he contacted me quickly and said he could come that day to give me an estimate. That was on a Monday and he told me he could install our backsplash on Friday. I took a chance; previously, I’ve always used people I know. I did look briefly at his online reviews, long enough to see that he had 4 and 5 stars. It worked out fine. The guy came when he said he would, he had 3 people with him, they were here from 9 in the morning until 5 in the evening … and they did a super job! I’d absolutely recommend this contractor in a minute; he was great. I should also tell you I have a husband who’s retired and can build or fix anything, including plumbing and electricity. It’s very rare that we hire anybody, and he actually thought that he could do this himself, but there were 7 electrical outlets involved. When the contractor’s crew was finished, my husband said that he never could have done what they did. He watched them install the backsplash, because he likes to learn, and realized that he wouldn’t have done it right. We went with very tiny little tiles, thinking you could put up the whole sheet at once, but they took every single tile off and installed them all individually. It was like a giant jigsaw puzzle. Now our kitchen is really finished and I’m enjoying the results, especially the backsplash and that gigantic sink! Toilet Replacement + Grab Rails = Access for Disabled Homeowner by Juan C.
I Needed a New Gas Furnace Install Due to a Cracked Burner by Norm R.